If you're on a mission to love up your gut, you probably wake up every morning and take a probiotic with a glass of warm lemon water. Classic ritual. But unless you're putting in just as much effort to FEED and NOURISH those bacterial strains, you're basically planting seeds then not watering them. You see, probiotic supplements mostly act as tourists in our bodies. They travel through, see the sights, hang out by the Eiffel tower (errr... the large intestine?) and then they say their goodbyes. But it doesn't have to be this way! If you travelled to a country where the weather was perfect, the food was amazing, and the people were friendly... you'd be pretty tempted to stay, right? Prebiotics create a gut environment that bacteria will flourish in, so you'll get more out of your probiotic supplements. You'll also feed the native bacteria that will always stick around while creating a more diverse microbiome. This means better moods, a stronger immune system, and better nutrient absorption for you - win-win! SO, WHERE CAN YOU FIND PREBIOTICS? All these foods should be eaten raw to get maximum prebiotic benefits. I know, I know... not a super appetizing food list. Getting tons of prebiotics in your diet means getting familiar with some new foods that are sometimes hard to find, sometimes hard to prepare, and sometimes... kind of gross - raw dandelion greens? I'll pass. That's why I was so, so thrilled to learn about Genuine Health's new fermented organic gut superfoods+. As a nutritionist who is totally obsessed with gut health, I love anything that makes it easier for people to get more gut-loving nutrition in their lives! This amazing gut-loving food-based supplement has been fermented to provide a great source of amplified and concentrated plant nutrients for gut and overall health. It's more than a fibre supplement! It contains 22 fully fermented plant-based superfoods and prebiotics to nourish a healthy gut flora. Polyphenols feed your gut too, so I love that they included nutrient-dense plants like spinach, sweet potato, broccoli, beets, pomegranate, and so many more! I won't lie, I'm kind of obsessed... this delicious powder can be shaken up with water OR added to recipes... which brings me to the recipe I'm sharing today. And man, is it a good one. These Orange Ginger Prebiotic Breakfast Jars are the perfect follow-up to your daily probiotic because they literally FEED YOUR GUT! Plus they're filled with anti-inflammatory ginger and it’s the perfect seasonal breakfast recipe for the winter months when citrus and pomegranate are in season. I used the Orange Ginger flavour of the Genuine Health fermented organic gut superfoods+ to enhance the flavour of the entire recipe. Chia seeds are the perfect pairing to a prebiotic meal with their soluble fibre that helps remove excess cholesterol from the body and makes for some epic poops! Filled with healthy fat, protein, and fibre these breakfast jars will balance your blood sugar and keep you going strong all morning! You can also say SEE YA to that mid-day bloating that hits you after a low fibre breakfast like muffins from the coffee shop. They are great to make-ahead for your busy mornings, so you can grab-and-go with no excuse to fall back on that coffee and muffin that won't exactly love up your gut. I hope you love these breakfast jars, and can't wait to hear how they make you feel! 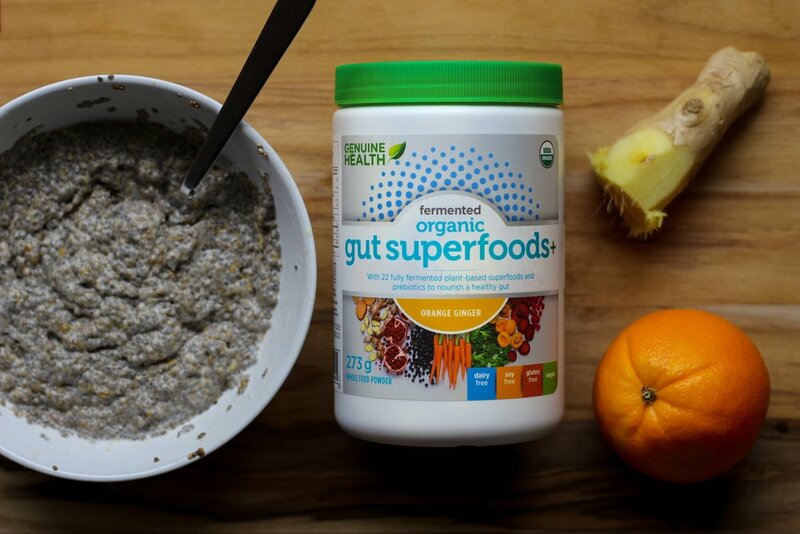 To learn where you can buy Genuine Health’s fermented organic gut superfoods+, take a look at their store finder. The perfect make-ahead breakfast to fuel your on-the-run mornings while loving your guts and nourishing your inner garden. Prebiotic fibre, fermented gut superfoods, fat, and protein with a delicious citrus ginger flavour. In a bowl, combine the chia seeds, zest of ONE orange, cinnamon, ginger, and the Genuine Health fermented organic gut superfoods+. Stir to combine well.Add the coconut milk, almond milk, juice of ONE orange (the same orange you zested), and honey. Whisk well to combine Let set in the fridge for 3 hours.Peel and slice the second orange. 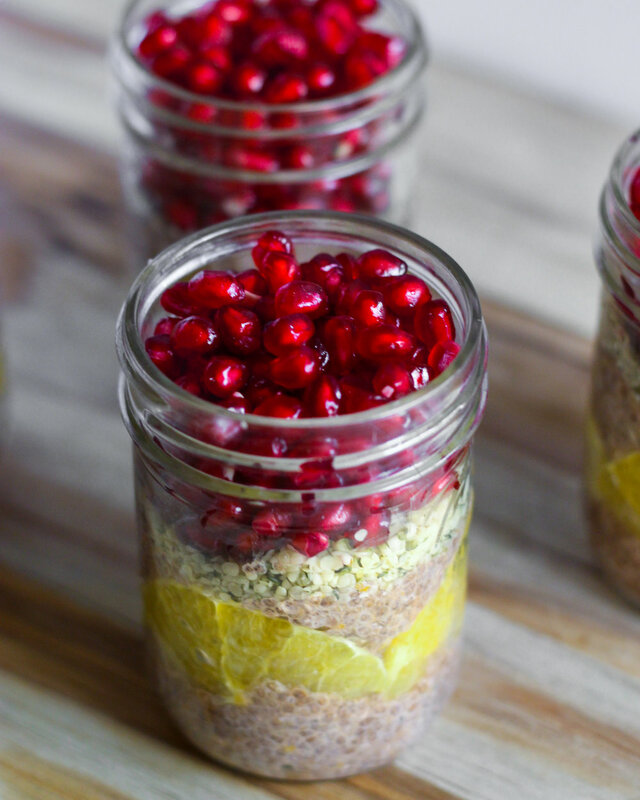 Assemble the jars by layering the chia pudding, orange slices, hemp sees, and pomegranate arils. Store in the fridge for up to 4 days. Enjoy the bloat-free breakfast! Disclaimer: this post was created in partnership with Genuine Health, which lets me support my blog and continue to provide heaps of valuable free content to you. Sponsorships are carefully considered and I only accept partnerships with brands I love, buy from, and 100% believe in. I am so grateful to be able to help people with the work I do, and partnerships like these make it possible!